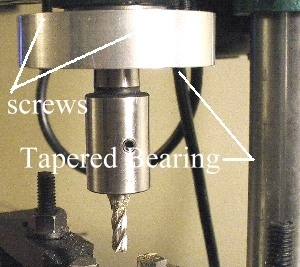 The following describes the construction of a homemade CNC milling machine based on two main components, a cheap $79 drill press and a $149 milling table. NOTE: the following is for information purposes only. Remember, you get what you pay for. And, unlike many web sites on home CNC, I'm asking for no money for the "knowledge" contained here. I will bear no responsibility for any loss or injury resulting from the somewhat crazy ideas below. Use at your own risk. 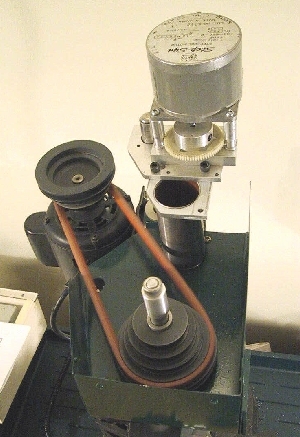 1) The 8" bench top drill press was chosen as it provided a cheap source for a number of parts, the head casting, from which the spindle would be made, a post for the head to traverse, sheaves (pulley), an electric motor and weight. 2) The milling table provides a heavy casting with a machined flat top surface, T-slots for clamps, dovetail slides with adjustable gibs, and a X & Y axis that are exactly 90 degrees apart. The name of the game in milling is to provide a solid and stiff structure to reduce any problems with vibration when machining. Altogether, the mill weighs about 75 lbs, including 20 lbs in counter weights. Max cuts with a 1/4" end mill in aluminum are around 60 thou, and max cuts for mild steel are around 20 thou. 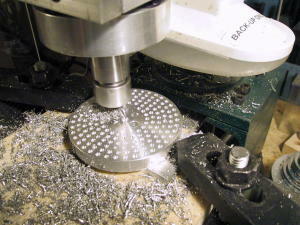 I used the spindle housing casting off the drill press to form the basis of the mill spindle housing. 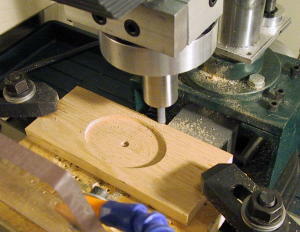 Unfortunately, the drill press spindle, had too much slack to use for any kind of milling. All of the spindle bearings, the drill press quill and the crank handles were removed. I also found that where the drill press head mounts onto the 2" dia. post, a simple roll pin kept the head from sliding down the post. 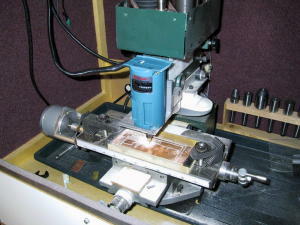 Removal of the pin, allow me to use the 2" post as part of the Z-axis linear slide. Luckily, on my drill press, the holes for the post were manufactured accurately enough to allow the head to smoothly slide up and down the post without very much slack. 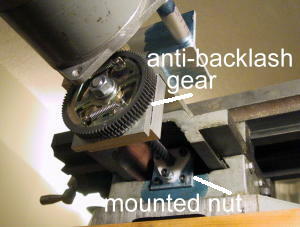 The picture above shows the drill press head casting, up side down, with all of the original parts removed. 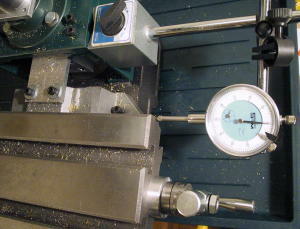 As can be seen down the spindle hole, I have started to fill the original quill housing with bearings (5 ball bearings). Also, you can see the four tapped holes around the spindle opening. This will eventually hold the final tapered bearing, which will pre-compress the bearing stack. 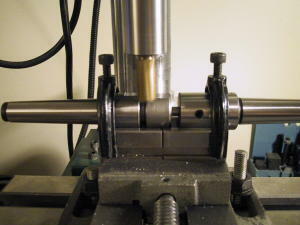 The actual spindle shaft is made in two pieces (due the the short length of my lathe). The top of the shaft, with shoulders for the sheave, 2 stacked bearings and 1 single bearing is shown above. A set screw on the bottom holds the shaft to the bottom shaft shown below. Here is the bottom shaft, shown with the snap rings. 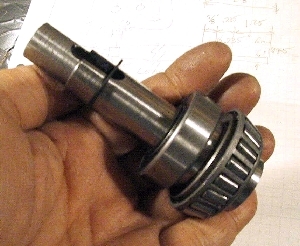 Another bearing sits above the top snap ring, and the bottom ball bearing is shown in position above the tapered bearing. Again, with stiffness as a major concern, as many bearings as I could fit in were incorporated into the design. Also note, the bottom shaft was turned from a Morse Taper (MT) #2 to MT#4 adapter. The slot in the shaft is for the MT tang. Above shows the spindle in place with the housing for the tapered bearing. By tightening the screws the tapered bearing compresses the 5 ball bearings against the top of the bearing stack. Finally, due to the new orientation of the drill press motor, a new v-belt gaurd was fabricated. Remember, Safety First! Here's the assembled spindle spinning! Note that I used a "link-belt" v-belt. I find them quieter and that they produce less vibration than standard single piece v-belts. 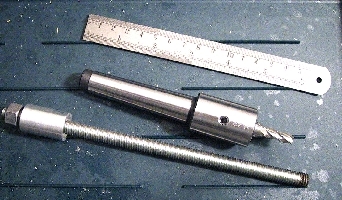 For this spindle, a Morse Taper #2 was chosen for tooling. 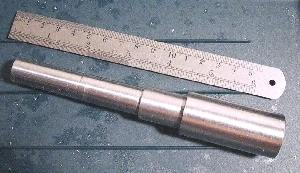 This taper was used, as it could be accommodated in the bearings as well as to the availability of tooling in this size. Above is shown the a MT#2 blank drilled and reamed to hold a standard 3/8" Weldon shank tooling. Also note the 3/8"-16 UNC thread rod which acts as a draw bar. This prevents the taper from working loose under heavy side cutting operations. Here is another MT#2 blank turned to accept "Taig" lathe collets. Shown on the right is a 1/4" collet and closer nut. Here, you can see the head mounted on to the 2" post. 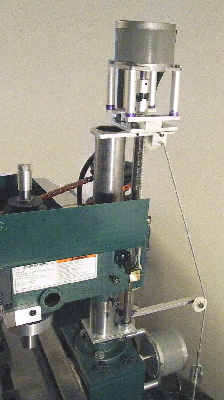 Note how the head can slide past the top of the post with the removal of the roll pin. Also, seen on the right, the aircraft wire around the pulleys down to the 25 lbs of weights under the table, to counter balance the spindle head. The stepper motor is coupled directly to the lead screw at the top. In this close up shot, you can see the main post and the 2nd rail. The 2nd rail prevents the head from spinning when under heavy cuts or when traversing up and down. The 2nd rail is made from 3/4" dia. cold rolled steel. 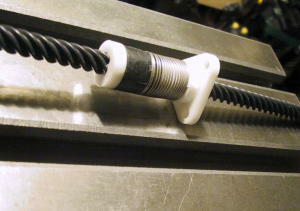 The lead screw for the Z-axis is made from 1/2-20 UNF grade 5 threaded rod. 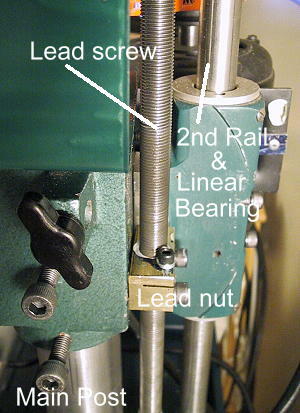 The lead nut is just a 3/4" square brass rod, with a 1/2-20 thread tapped in the middle. A small saw kerf in the brass, allows for adjustment to take up backlash. 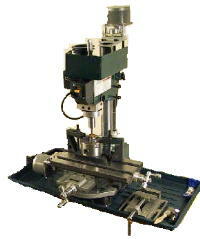 However, due the weight of the spindle head and counter weights, the backlash is never a problem. The cast steel milling table has a 12" x 5-1/5" surface with 1/2x1" T-slots. Dovetail slots with adjustable gibs permit solid machining. The only problem with the table is that the 5 tpi acme screws it came with have a lot of backlash. Above are the final replacement lead screws. They were bought surplus from a mail order place in the USA. Made by Kerk Motion Products, they have 1 tpi and 1/4" dia shafts at each end. The harden steel threads are coated with teflon, to provide a very efficient ( >75%) conversion from rotary motion to linear motion. The big bonus with these lead screws is that the nut is self compensating for wear. I had initially used threaded rod with two brass nuts to take up the backlash for the replacement lead screws. Although they did work, and quite accurately, I did have to periodically take apart the table to adjust the backlash mechanism for wear. Here can be seen the method by which I mounted the lead screw and nut to the machining base. Due to the method that I used to mount the new lead screws, the maximum travel that I can get is reduced to 5-1/2" in the x-axis and 4" in the y-axis. (the table is advertised as having 8"x5" travel) Also shown is the anti-backlash gears (from a local surplus store) that I use to gear down the stepper motors. 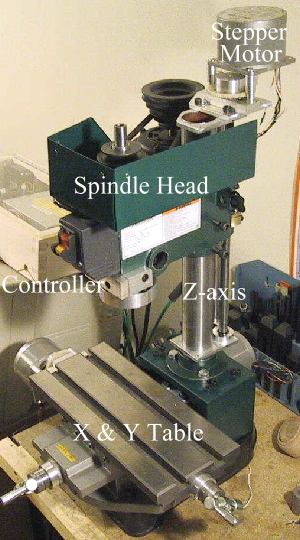 Here, you can see the process of calibrating the X-axis backlash with a dial gauge temporarily attached to the side of the mill. Hopefully, the dial needle will return to the same place! 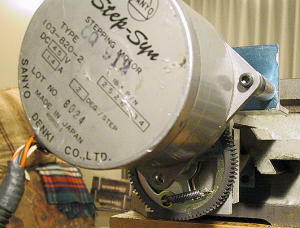 The 6-wire stepper motors were also purchased surplus. They are rated at 4.5V, 1.4A with 2 deg. steps. They are reported to produce 130 in-oz of holding torque. I run mine with a current chopper circuit at 24V, and can achieve over 1000 steps/sec (resulting in 60 inch/min) on either the X or Y-axis. The original drivers that I used were based on the Allegro 5804b stepper motor chips. Theses unipolar drivers could not produce enough torque at "high" rpm's. My current drivers are based on the ST electronics 293/L298 chip pairs. These chips can be set to current limit power to the stepper motors, thus allowing the user to "over" voltage the stepper motors for better torque curves at higher speeds. Schematics for driver circuits for the ST 293/l298 chips are available on the manufacturer's data sheets. Above, is mini-mill is shown with the controller box (brown wooden box with the hand cut dovetails) sitting on top of the enclosure. 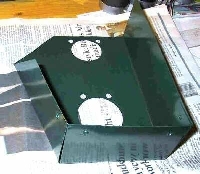 The enclosure reduces the amount of noise and dust kicked up by the machine. 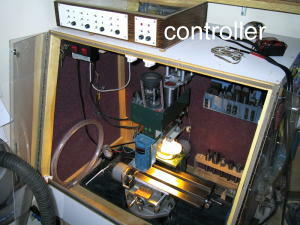 I use a PC based controller to convert the CNC g-code to the proper step and direction signals to the controller box. These signals are sent out the parallel cable of an old PC. I prefer to use a LinuxRT based software called EMC. It is available for download for free on the internet. Here are some of the projects that I have made on my homemade mini-mill. Many of these can be made on an conventional manual mill, but some of these are only practical using a CNC milling machine. 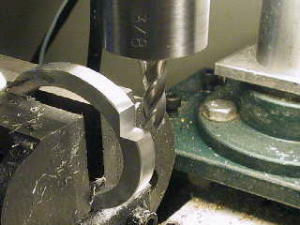 In the above picture, I am cutting a step in aluminum using a 1/4" end mill. Notice the surface finish. Here, a camera part is being made from 1/8" thick brass. Cutting an elliptical pocket out of oak. Why? Because I can! Flats on a tool steel MT#2 stub are being machined with a 1/2" dia. end mill. 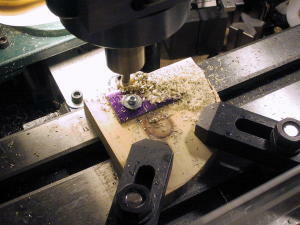 Holes in an index plate are being drilled. Easy with a CNC mill. Here, I have attached a Makita laminate trimmer to provide a high speed spindle (> 12,000 rpm) for machining traces on a "printed" circuit board. 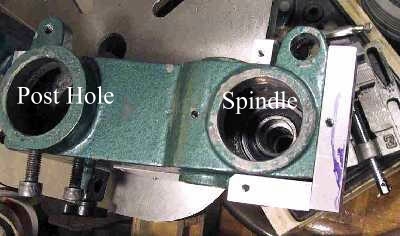 The same spindle is also used to drill the through holes. created Jan 31st, 2003 by V.Chan.